This week’s Sunday Supper theme is Sleepover Foods. Truthfully, since I don’t have kids, I can’t remember the last time I went to a sleepover. Unless you count camping, which I guess is a more adult form of sleeping over involving beer and campfires. If I were to have an adult sleepover, I would definitely want a great breakfast in the morning. These sweet potato waffles definitely qualify! You could easily substitute pumpkin if you want to seem more “trendy,” but the crowds I run with aren’t so interested in the trendy. The sweet potato means it’s quite healthy, perfect for after an evening of drinking. Melt 1/2 C butter and set aside to cool. Cook and mash 2 C of sweet potatoes, stir along with 6 eggs (beaten) and 2 C milk into the cooled butter. Stir together 1 C whole wheat flour, 1 C rolled oats (finely ground in blender), 1 C pecans (finely ground), 2 T baking powder, 2 tsp salt. Sift together into the sweet potato mixture. Mix until combined and bake in a hot waffle iron. These waffles are VERY filling but so very, very tasty. I could taste the sweet potatoes and spices. I wanted to sprinkle some cinnamon and nutmeg and whipped cream on top but DH said he thought they were just fine. It took a bit of work to make these, but when I think that it didn’t contain any white flour, I’m pretty impressed. So these are a good brinner recipe, or lazy weekend breakfast. Oooh, sweet potatoes and nuts and oats – such a comforting and hearty dish. Perfect for breakfast or even dinner! I love the sound of everything in these – hope to give them a try! Another great breakfast to hide veggies from my toddler. Love it! 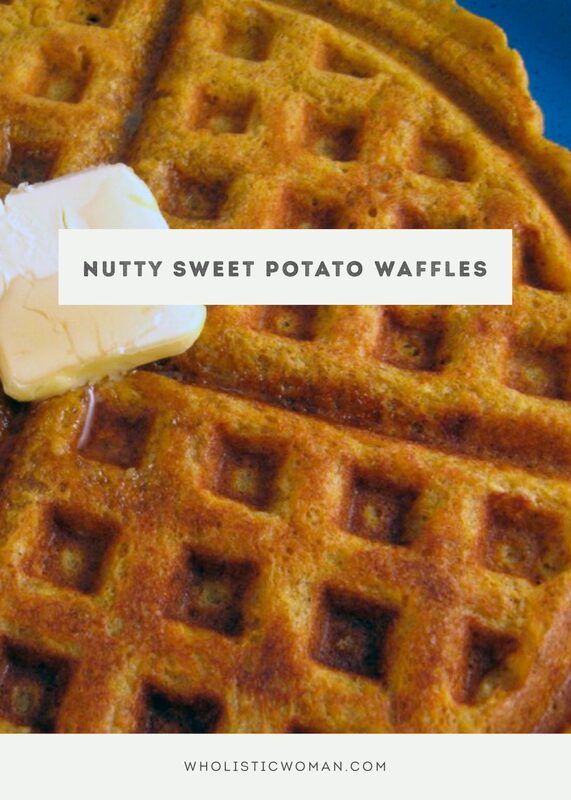 Sweet potato waffles are one of my favorite way to sneak goodness into my son’s diet. The added benefit of oats and pecans is great! Can’t wait to try these.